fun facts | Vincent Cannataro, Ph.D.
Spider Sunday is back! This week: Wolves in Your Backyard. I have a confession. When I was young I wasn’t very kind to spiders. My behavior can likely be attributed to fear; growing up we are surrounded by imagery of spiders being dangerous and alien. We fear what we don’t understand. The internet says Marie Curie once said “Nothing in life is to be feared, it is only to be understood. Now is the time to understand more, so that we may fear less.” And it’s true, the more I learned about spiders the less I squashed them. Now that I’m older, and a biologist, and living in Florida (read: constantly surrounded by giant spiders), I see spiders as fascinating, useful, and largely innocuous. And I’m on a mission to spread this view in order to gain back all the biology-karma I lost squashing spiders in my childhood. So, here are some neat facts I just learned after to a recent encounter. Reflections. Reflections from eyes. 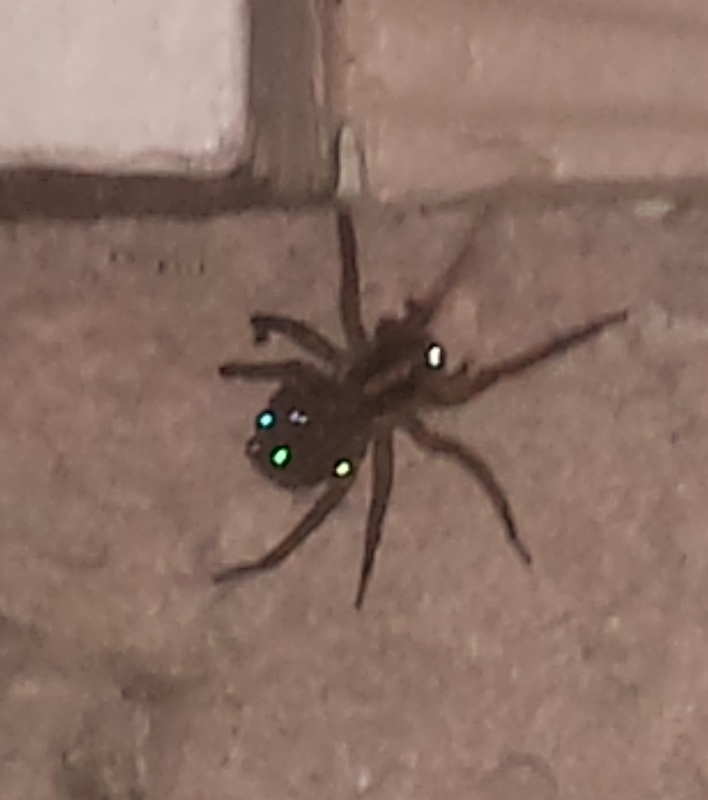 But wait, why are there reflections coming from the spider’s abdomen? 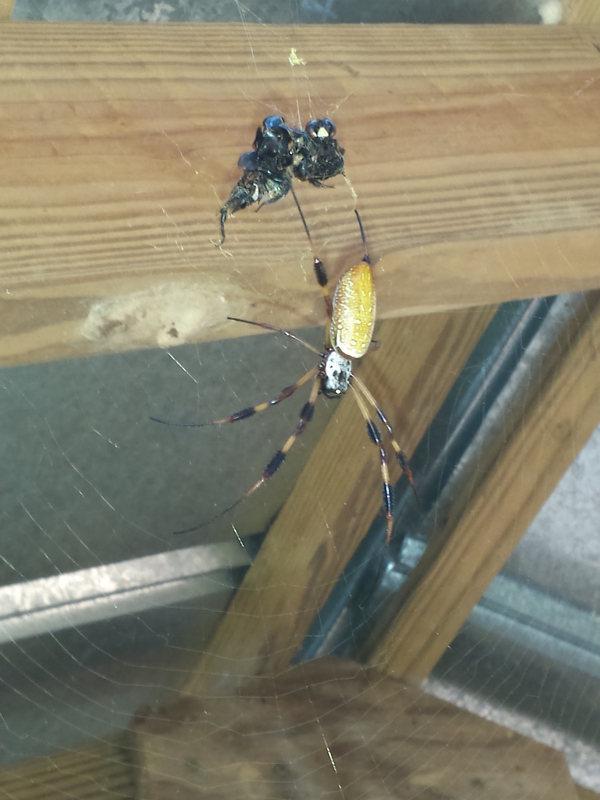 Golden Orb-weaver, La Chua Trail, Gainesville FL. This is very similar to the reflections we’ve all seen before when shining a light towards certain mammals at night, such as cats or raccoons. 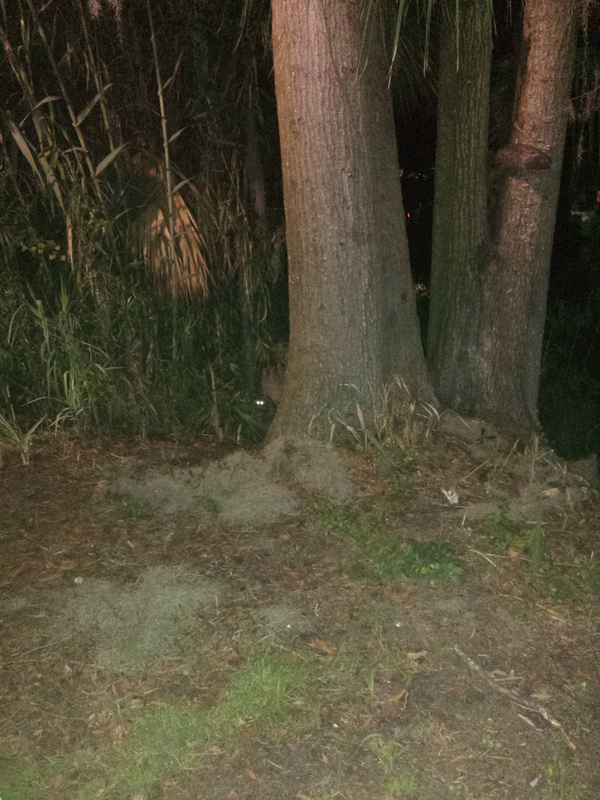 Raccoon hiding out behind UF’s Science Library, Gainesville FL. So, what’s going on here? By reflecting light back through the retina there is more light available to the photoreceptors- enhancing night-vision. In vertebrates this is accomplished by the tapetum lucidum, or “bright tapestery” in Latin, a thin tissue membrane in the back of the eye. It looks like the tapetum has evolved independently in invertebrates and vertebrates, and actually exists in several invertebrate taxa including scallops, crustaceans, scorpions, and dragonflies. The tapetum in invertebrates consists of parallel strips of reflective guanine crystals- the same type of crystals that give fish their shiny metallic skin and allow chameleons to shift their skin color. Want to see it for yourself? Go outside at night and shine a bright light into the grass. Those hundreds of reflective dots shining back? Wolf spiders looking at you. But fear not, for now you understand more. Just wear shoes. Woah, I’m way backlogged on blog posts! Don’t worry, I have some cool stuff in the works and I’ll share soon. In the meantime check out some of the science I’ve been starting my classes off with this month. Aging research: blood to blood – scientists can splice animals together by creating a wound in each animal and sewing them together- their natural wound healing mechanisms join their bodies and their blood (it’s called parabiosis)! If you splice an old animal to a young one the tissue in the old animal gets “rejuvenated” by the young animal’s blood. Sounds like the premise for a horror movie. Scientists have discovered a new antibiotic that kills pathogens without detectable resistance. Scientists have discovered that tumor cells can actually acquire previously lost DNA (in this case mitochondrial) from “normal” cells, and that the newly acquired DNA restores missing function. Think about that. Somatic cells (or cells that were once deemed somatic but now have become tumor cells) can horizontally transfer DNA. Biology textbooks get rewritten every day. And, of course, I can’t introduce metabolic scaling and not discuss the invariance of heartbeats.